Travel blogger Hannah and her boyfriend Lee (who could once be found at the Hove Flight Centre branch) have recently embarked on an inspirational round the world trip. We’ll be following their journey along the way – stay tuned for updates from the road. First stop: Goa. Hello, my name is Hannah and I am a travel blogger and graphic designer from Brighton. I am currently one month in to a new life of indefinite round-the-world travel with my partner Lee, a Scotsman who I met five years ago whilst we were both travelling in Goa, India. At the time he was strolling along the shore wearing a kilt, so it was pretty hard not to notice him! Since that day we have dreamt of continuing our travels together, and have taken several holidays to places such as Italy, Egypt and back to India again, but a two-week break was never enough to satiate our thirst for adventure. So back in 2010 we decided to take the plunge and make travel our way of life. But there were many obstacles to overcome first, namely the small issue of my £15,000 credit card debt, and our zero balance savings accounts! I set myself the goal of clearing my debts within one year, and became completely focused on that. I took on three extra part-time jobs in addition to my day job as a graphic designer. It was a huge undertaking, and meant a lot of sacrifices, but it was worth it. Exactly nine months later, I was completely debt free. That was back in August 2011. After that, we decided to give ourselves another year to try and save as much money as possible, and set a departure date of 30th September 2012; first stop Goa, back to the beach where we first met. I continued to work extra jobs and we also began the long process of selling everything we owned. We spent countless hours listing items on eBay and Gumtree, and standing out in the cold at more car boot sales than I care to remember. Everything went, from our furniture to our car. What we couldn’t sell we gave to family and friends or donated to charity, and it was strangely satisfying to feel released from the responsibility of owning so much ‘stuff’. Now, all that’s left are the clothes in our backpacks and a few boxes of winter clothing and books that my mum is kindly storing for us back in Brighton. It has been a long, emotional and stressful process, but now here we are at the very beginning of everything we have dreamed of. And I can tell you that it was all absolutely worth it. 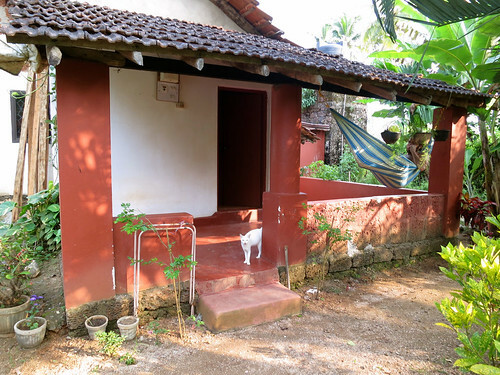 Three weeks ago we secured the rental of a little house in Colomb Bay, Goa, a quiet cove nestled between Palolem and Patnem. We will be living here for the next three months, before moving on to Kerala, then across to Sri Lanka and onwards around the world. We plan to travel slowly, and with no real plan other than to follow our hearts. I will be volunteering as much as possible with various different charities, and doing research for my ultimate dream of one day establishing my own charity. I will also be leaving Lee for a few weeks at the start of January to take part in the Rickshaw Run, a 3,500km drive across India in an auto-rickshaw, in order to raise money for the charity FRANK Water. I will be taking part with two other female travel bloggers (who I haven’t actually met yet!) and we are writing about our endeavour over at our joint blog, Rickshaw Run Diaries. We are aiming to raise at least £2000 for the charity to enable them to install clean drinking water in villages below the poverty line all across India. If you would like to help support us please visit our JustGiving page. So for now we are looking forward to exploring our new home for the next few months and enjoying the colours and chaos of India. There is a small desk in the house for me to work from, and the Indian family next door is going to teach us how to cook some local dishes. The house even comes with a resident cat, and she just gave birth to three adorable kittens! After the stress and hard work of the past two years, it is a welcome opportunity to slow things down, relax, and settle into our new role as world travellers. Nothing happens quickly around here; everything runs on Indian time, a pace dictated by the heat and chatter of happy conversations. And that suits us down to the ground. So stay tuned, as I have a feeling many wonderful things await us, and I can’t wait to share them with you. Follow Hannah's journey on her blog Further Bound, and on Facebook and Twitter as she and Lee map out a new life on the road.